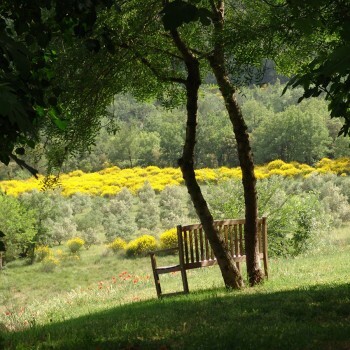 The STUDIO is a restoration of the southernmost part of the 18th century olive mill, with direct access to the grounds overlooking our valley and the hills beyond. It is completely private, with its own pool to the west of the property. The Main Room is 30 meters square, with an impressive stone vaulted ceiling and a west-facing window. It is very comfortably furnished with good quality modern and period furniture, cd player and tv. Sleeping accommodation is provided for two (large double bed : 1m60 wide). • The Kitchen is south-east facing, with a dining area. It is fully-equipped with small refrigerator, electric hob, micro wave oven, electrical appliances (kettle, toaster, coffee maker), and good quality china, glasses, and cutlery. • The Shower Room faces south, with large shower, basin, water closet. There is also a washing machine, ironing board and iron. 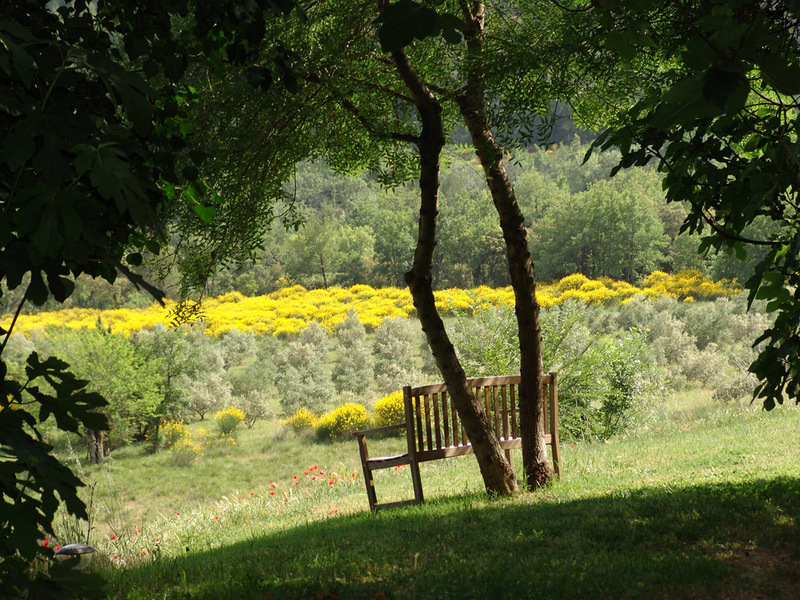 • The Grounds immediately surrounding the studio have been landscaped to provide a grassy terrace with dining furniture and wonderful views across the valley leading down to the river. 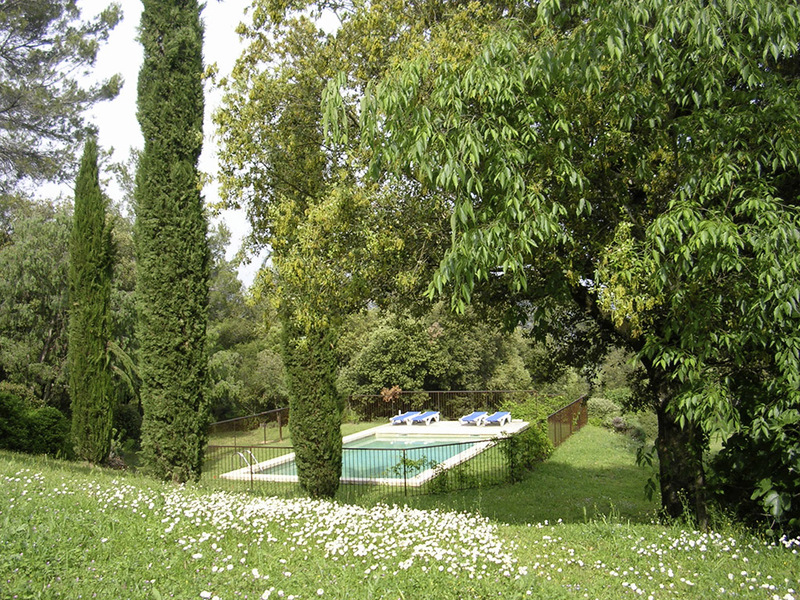 • The private and secluded pool (inground, reinforced concrete, 5.5m diameter) is to the west of the studio, secluded and surrounded by oaks, pine, ash, and fig trees. 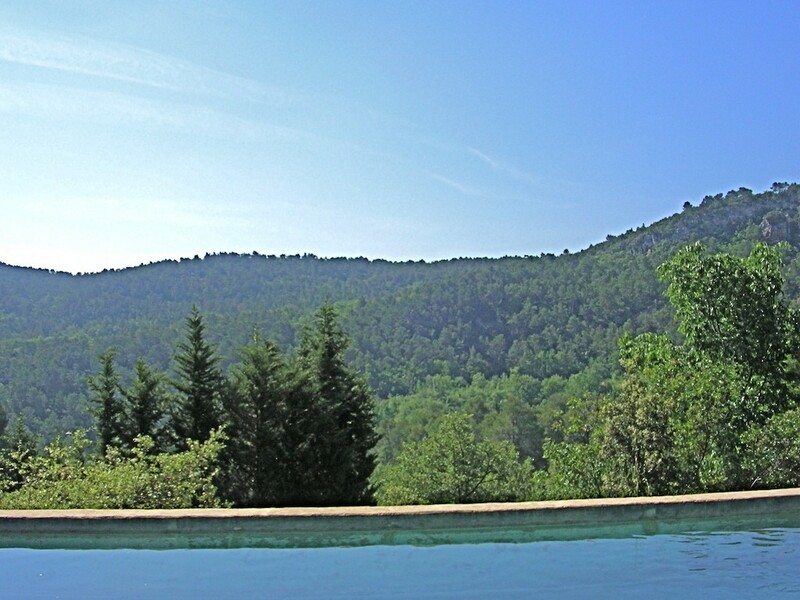 It has outstanding views which extend for miles. Kitchen herbs (rosemary, thyme, fennel, and mint) grow abundantly and there are mature fig trees for shade and fruit. Wild asparagus is plentiful in spring. The studio has its own access road.